Boston Beer Company, the makers of craft beers such as Samuel Adams and craft ciders such as Angry Orchard, has seen their stock trend down now since topping out at $320 per share near the beginning of 2015. The stock now sits at around $177 as of mid-day trading on Friday, February 19, 2016. Why is the stock down nearly 45% from it’s high point a year ago and 12% year to date in 2016? Boston Beer has grown its revenue from $238 million in 2005 to $1 billion by the end of 2015, which represents an annual average growth rate of 15.4%. Net income has grown from $16 million to $98 million over the same period, representing an astonishing 20% annual average growth rate. Earnings per share has grown over the past ten years from $1.07 to $7.25 per share, mirroring net income growth with a 21% annual average growth rate. Total shares outstanding has not grown, but actually shrunk by 13% over the past ten years, going from 15 million shares to 13 million shares outstanding, meaning that owners of the company, instead of being diluted, have seen their share of profits rise as shares were bought back and destroyed. Operating cash flow has consistently been above net income through the past ten years, hinting at high quality earnings. Free cash flow has been a bit more erratic, without the consistent growth that the other figures have shown. This has been in part due to the company’s willingness to aggressively plow back cash into the business to expand its operations and protect and grow the brand. Gross margin has modestly shrunk over this period from 59% of revenue to 52% of revenue. However, the operating margin and the net profit margin have expanded over this period. Looking through the balance sheet, there is minimal leverage employed by the business. What’s breathtaking to look at, in respect to the minimal leverage employed, are the profitability ratios: Return on Assets of 17%, Return on Equity of 25%, and Return on Invested Capital at 25%. Boston Beer is a highly profitable economic engine. Projected full year consensus earnings per share by 9 analysts is estimated to be about $8 per share in 2016. With trailing twelve month earnings per share, Boston Beer is trading at 24.4 times earnings. With the forward looking estimated earnings per share, Boston Beer is trading at around 22 times earnings. For a $2.2 billion market cap alcohol enterprise, that has carved out a large niche within the craft beer and cider segment of the alcohol market, and one with a potentially long growth runway ahead of it, Boston Beer begins to look very interesting at current prices. Throw in the fact that the firm is controlled by the founder and chairman James Koch through his 100% ownership of the Class B shares, shareholder’s interest are highly aligned with the owner of the company. James Koch has been committed to long term thinking and planning with the company, willing to forgo short-term profitability to build and strengthen its brands. Despite all of these glowing marks, Boston Beer’s stock has suffered over the past year as competition has been intense in the craft alcoholic beverage segments it operates in. There has been some share loss in the core craft beer market and it has had difficulty in maintaining the rocket ship like growth in the craft cider market. There has been inroads made into the craft beer market by beer giants such as Anheuser-Busch InBev (NYSE: BUD). Despite some headwinds it is currently facing, Boston Beer is well positioned as a major craft beer and cider play to continue enjoying growth in the fast growing craft beer and cider market in the US. At the current stock price of around $177, you are paying around 24 times earnings for a profit pounding machine that is operating in a growing and expanding market, that has demonstrated historically that it can grow its revenue and profits consistently over time, and one in which there is still a long runway for expansion as long as the craft alcoholic beverage market in the US continues its momentum in popularity and demand. While not a screaming bargain, the stock is at a price point where it is a fair entry point for the profits it currently generates and the projected profits to come. Disclosure: This author has no positions in any stocks mentioned and does not plan to open any positions in any stocks mentioned for at least 72 hours after publication of this article. 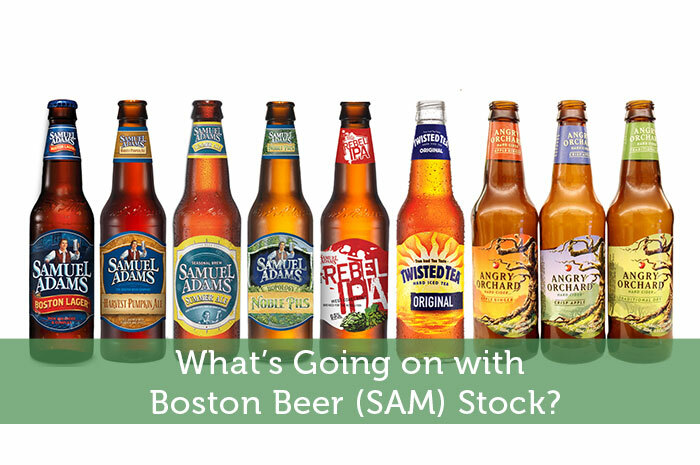 What’s Going on with Boston Beer (SAM) Stock? Steve Jones is a private investor from Canada. His investing philosophy is grounded in large cap value stocks. He is also the founder and owner of Kapitalust. I’ve always liked this company.. and Twisted Tea for that matter. I agree that the recent drop in price is a long term buying opportunity. Buy great companies, at good prices, and you will make money over the long run. Thanks for this great article! Will be sharing on Twitter. I think there was some irrational exuberance going on with the stock price at its height and would have avoided paying such an earnings multiple, but the recent fall down to earth makes it more interesting to look at. It does look like a quality operation and as long as craft beer and cider remain popular, it should be able to carve out a nice corner in that niche for a long time to come.